The apartment is suitable for 2-4 people. It is equiped with a queen size bed,a sofa bed that is big enough for two and if needed an extra put up bed can be added. There is a private bathroom and also a kitchen space with a fridge,kettle,sink and microwave. The garden area has a view mostly of the east side of the island. It is shared with 1 more apartment and our family and is big enough for all. Our neighbors are quiet and friendly. The apartment is one room with 1 private bathroom. It is ideal for families,close friends and couples who wish to spend peaceful and relaxing holidays. 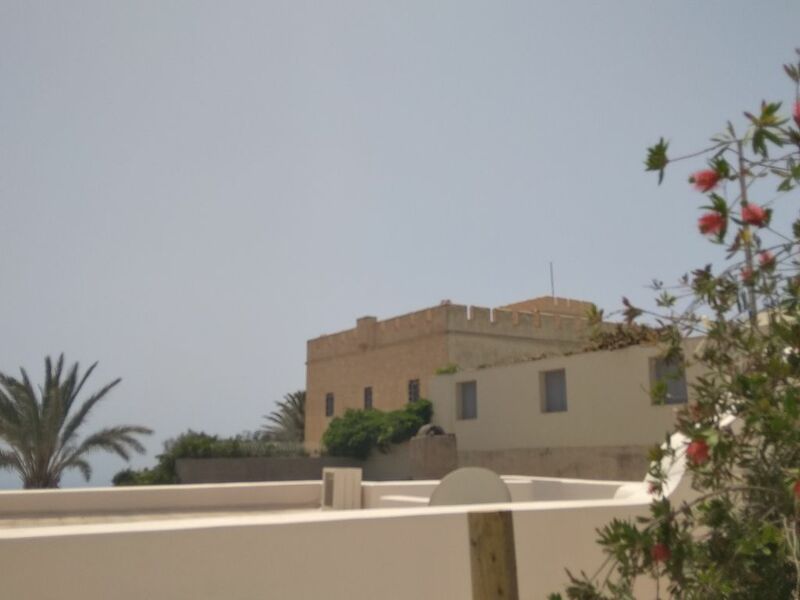 The garden is very spacious with a lovely view of Anafi island,other villages,mountain and sea view. Sunrise is spectacular from the garden in the early hours of the morning. You can also park right outside the property. Firostephani bus stop is 2min by foot and main bus stop is located in Fira 5-7 min by foot. Scooter/car/atv rental is available in the village. Caldera View is 30 sec walk. Fira centre is 3-5min walk. Cable car is 3min walk. Closest beach is 10min drive. Airport is 10 min drive. Main Port is 15min drive. Generally Firostephani is located in the middle of Santorini so you are half way to everywhere. The Garden View Apartment is situated in Firostephani,a small,quiet and traditional village just 5 min walk from the town centre of Fira and 30 seconds from the spectacular view of the Caldera. It is an ideal place to stay if you want to be close to the centre but not right in it. A lovely square is within 2min walking distance with a great view of the caldera,volcano and surranding villages and islands. Mini markets,travel offices,restaurants,traditional tavernas and cafes are also located around the square. The neighborhood is very safe as local families live and own most of the village businesses. The Garden View Apartment is situated in Firostephani,a small,quiet and traditional village just 5 min walk from the town centre of Fira and 30 seconds from the spectacular view of the Caldera. It is an ideal place to stay if you want to be close to the centre but not right in it. Anafi island,other villages,mountain and sea view can be viewed while relaxing in the garden which also offers a spectacular sunrise in the early hours of the morning. 1min walk and you are on the side of the cliffs with the most famous postcard of santorini: The blue dome church,caldera and volcano. You can also park right outside the property. A lovely square is within 2min walking distance with a great view of the caldera,volcano and surranding villages and islands. Mini markets,travel offices,restaurants,traditional tavernas and cafes are also located around the square. The neighborhood is very safe as local families live and own most of the village businesses.